With around 150 plus movies under production, 2013 would get into record books written in golden letters to release 200 movies in a current year. It seems that the young generation malayalis are too passionate towards the dream world of entertainment getting involved in projects either in front or behind the camera. The popularity and fame which the movie industry could provide might be a cause along with a passion to screen his/talent. 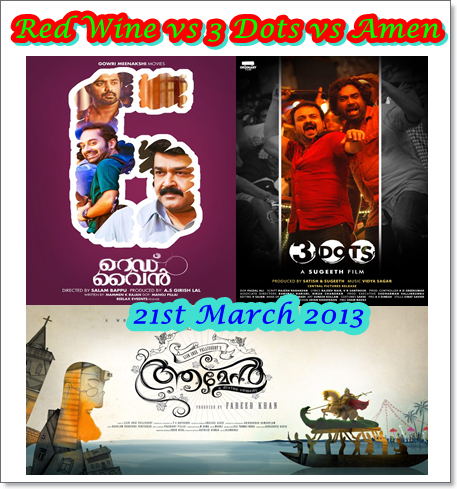 After clocking 35 releases in 2013 till 8th March, more movies are in the line gearing up for grand release in the coming weeks. As the summer vacations are nearing, there will be more big releases expecting huge responses from the family audience. 21st March will be an important day for movie lovers as a couple of most anticipated movies would reach theatres for the verdict. Even though, there might be more releases, 3 biggies Red Wine, 3 Dots and Amen would be the prime focus which can drive viewers to the theatres. Red Wine, the directorial debut of Salam Baapu will bring Mohanlal, young actor Fahad Faazil and Asif Ali onto a single platform. After working behind the camera as assistant director for 10 years,Salam brings out his maiden venture with Mohanlal playing the lead character Ratheesh Vasudevan, an investigating officer. This thriller will be produced by Gireesh Lal under Gowri Meenakshi Movies banner. Salam has tried his best to recreate the script written by Mammen. K Rajan. For the lyrics of Sarath Vayalar, Bijipal had rendered his magical chords which would give a realistic mood to the movie. Lijo Jose Pellissery who carries the spirit of direction in veins is back with a fresh theme after getting noticed for his previous ventures Nayakan and City of God. Amen touted as a romantic musical satire set at the backdrops of an ancient church in a village. Fahadh Faasil who don the role of Solomon falls in love with Sosanna( Swati Reddy) while Indrajith who enacts as Father Vincent Vattolli finds romance in Natasha Sahgal. The final touch of the movie is over and would reach theatres on 21st March 2013. 3 Dots directed by Sugeeth keeps much anticipation for being a movie which comes from the team which had given the extra 'ordinary' hit movie. 3 Dots which revolves around the life of three protagonists Louie, Pappan and Vishnu. They find happiness in life through companionship. Kunchacko Boban, Biju Menon, Prathap K. Pothan, Narain and Janani Iyer will be playing the lead characters in the movie which is coupled with a lot of fun and thrills along with many twists and turns making it comedy thriller with elements of family values. 3 Dots will be produced by B. Satish & Sugeeth under the banner Ordinary Films. The movie will be blessed with the presence of Vidyasagar, who would render his magical tunes. Faisal Ali who cranked the camera for 'Ordinary' is back as Cinematographer who had captured the natural beauty suitable for the scenes. As most of the youngsters would get relief from their hectic exams, all the three movies can expect full packed houses for the first few days. The fate of these movies depends upon its first show performance. So it is up to the viewers to decide their interest.